Be the first to share your favorite memory, photo or story of Ashford. This memorial page is dedicated for family, friends and future generations to celebrate the life of their loved one. Ashford A. 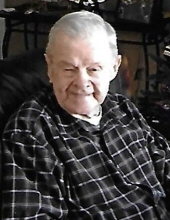 “Sonny” Hite, 93, a longtime Hyde Park resident, died Wednesday January 16, at home with his family by his side. Born on October 14, 1925, in Mustoe, Virginia, he was the son of the late Sullie and Annie Gutshall Hite. On July 5, 1975, in Port Ewen, he married the love of his life, Christine Sorrentino Gaal, with whom he enjoyed spending time with. Christine predeceased him on August 10, 2007. Mr. Hite was self-employed owning and operating Burgess Vending of Hyde Park. Sonny proudly served in the United States Navy, during World War II. He was a member of the Crum Elbow Rod and Gun Club in Hyde Park. Surviving are five children, Kevin Hite of Monroe; Nancy Austin of Monroe; John Gaal and wife, Darlene, of Port Ewen; Joanne Reynaud of Ulster Park; Christine Knapp and husband, Ron, of Poughkeepsie; a sister, Mildred Pells, Clinton Corners; nine grandchildren; and several great grandchildren. In addition to his wife and parents, he was predeceased by eight siblings. To plant a tree in memory of Ashford A. "Sonny" Hite, please visit our Tribute Store. "Email Address" would like to share the life celebration of Ashford A. "Sonny" Hite. Click on the "link" to go to share a favorite memory or leave a condolence message for the family.